Jetboard Joust Devlog #82 – A Sting In The Tail! To say that I’m glad to be finished with this next enemy would be something of an understatement. It’s been painful. I knew these more elaborate enemies would be time consuming but this one has caused me all sorts of headaches and I’m really, really sick of it. So sick of it in fact that I’m not even sure whether I’m pleased with the end result any more. 1. Wasps are very dark, consequently reference photos were very unclear on detail. 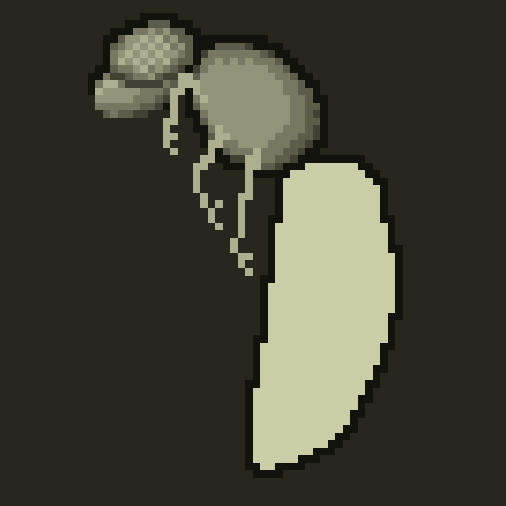 Also creating a dark sprite that stands out from a dark background with a very limited colour palette is tough. 2. Insects in general are pretty ‘fiddly’ creatures. The things that distinguish their character are actually pretty small and/or spindly which make them very hard to render in low resolution. I found the legs particularly hard and gave up trying to render mandibles as whatever I did they just looked like a beak. 3. One of the things that characterises a wasp is (obviously) the stripes on their abdomen. These are hard to render at low resolution as angled stripes just look too ‘jaggy’ and going for straight stripes just makes the abdomen look like a boiled sweet, too cartoony and not ‘creepy’ enough. I started off trying to make the sprite look too realistic, relying too much on reference photography. 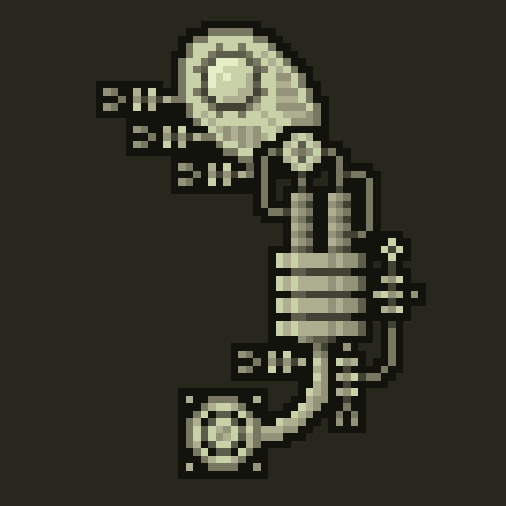 I then went down a complete ‘robot’ path, trying to create a creature partly from sprites that I’d already designed (mainly the ‘upgrade weapon’ icons). This had potential but was too bitty and I felt going full-robot lacked the creepiness I was after (never go full-robot)! Things only really started together when I sketched out a very stylised wasp by hand and went for an approach that was 50% ‘real insect’ and 50% ‘steampunk’. I stuck with very stylised angles where possible and this seemed to work, particularly on the legs which I was having massive problems with (I ended up separating these out as individual sprites). I reckon I was 3.5 days on the art for this alone. Thankfully coding the movement wasn’t too problematic, AI is very simple but seems to work nicely. The gamma-ray that it fires from its ‘sting’ was a bit of a pain in the arse as I had to redo my original gamma-ray code to cope with being aimed at an angle, this meant I needed to use raycasting for the collisions. Fortunately I could reuse code from the ‘shredder‘ weapon but still, this was non-trivial due to my lack of foresight in the way the original gamma-ray was implemented! There’s a two-stage attack pattern whereby the player must destroy the creature’s abdomen first. At this point the creature becomes faster, more aggressive, and starts to spit poisonous space-venom! The venom-spitting effect is created with particles. I still need to add some custom audio and maybe work on the explosions a bit more (these ones don’t seem bit enough and bigger enemies also need bigger bones!) but, for now, this one is finally done. Six bloody days!!! *** edit *** ….and, I’ve just realised when I grabbed this video that I had immunity on the player for debug purposes (groan). That’s why the enemy’s attacks aren’t doing any damage!! I need a break! Jetboard Joust Devlog #81 – On A Roll! In the late 1970s, when kids played with proper toys rather than tablets and smartphones, there was this marvellous toy called ‘BigTrak‘. I always wanted one, but they were way too expensive to buy and probably cost around £10k per year in batteries. I’m sure the reason there’s so many SUVs on the roads today is that all these 40-something-yr-old men are buying them as some kind of mid-life BigTrak substitute. I still think the BigTrak design looks pretty cool even today. This enemy, the ‘crawler’, was very much inspired by BigTrak, but it wasn’t just a nod to seventies nostalgia. At the moment gameplay seems to gravitate very much towards the top of the screen and I wanted something other than pickups to take the player closer to the ground and amongst the buildings. A ground-based enemy seemed the logical choice to do this. Usually I’d work on the art first but in this case I thought I’d run a few code tests first to see if the ‘tank’ type enemy I had planned had any kind of hope of succeeding. Maths is not my strong point, and as this vehicle would have to perform the impossible feat of traversing vertical slopes and 90° changes of gradient I needed to make sure it wasn’t going to look like arse before I wasted loads of time on the art. To my surprise my initial tests worked very well. There’s no ‘physics’ at play here, the wheels (working independently) simply traverse the outer edge of the terrain in the most basic way. I then work out the angle between the wheels (i.e. the axle) and place and orientate the chassis based on this. It’s not physically ‘correct’ by any means as the distance between the wheels changes depending on the terrain but, as it’s performing impossible feats anyway, I didn’t think this mattered – I could get away with a telescopic axle! In the final version I added something to make the wheels roll more nicely around corners but other than that I stuck with my first approach, I made a couple of attempts to make things more ‘realistic’ but both ended up looking worse than the original. Satisfied that I could make this work I then began work on the art. There were two keys things I had to bear in mind here. Firstly, the design needed to be such that the distance between the wheels could change without looking ridiculous as described above, and secondly that the vehicle could travel in either direction. I think you can get away with simply flipping sprites for left/right when they’re small but with larger sprites like this that approach can look pretty ropey. At first I was working on a ‘tank’ type idea that was similar to BigTrak. I spent several hours on this but wasn’t happy with anything I came up with. Everything looked too clunky or too much like a motorbike. So I started experimenting with some radical changes and in the ended settled on a kind of armoured ‘push me/pull you’ design that I felt worked much better. It’s a complex affair though, the final unit comprises eleven different sprites, so getting these all lined up and positioned correctly was a very fiddly business! Getting the guns to track the player was also fairly tortuous as one has to consider the rotation of the vehicle as well as the previous rotation of the gun to make things work smoothly. People with more of a maths brain probably find this stuff easy. I don’t, but I got there in the end. The AI wasn’t simple either. For individual vehicles it’s pretty straightforward, but when they appeared in batches I was getting issues (as with the Squocket enemy) of them overlapping too much. In the end I created a ‘hive mind’ class that acts as a controller for a bunch of vehicles. This class works out the ideal positioning of each vehicle and then the individual vehicles track to this position. Lastly I have the pilots of the vehicle man jetboards and make a last-ditch attempt to attack the player when their vehicle is destroyed. There’s a specific class for this type of enemy too (I’m calling it the Kamikaze) but it’s pretty much one of the basic minions with tweaked parameters. EDIT: Aaarggh – I thought I was done but whilst working on some screengrabs for this post I ran into a hideous bug to do with the world wrapping (remember I talked about that here?). I was getting all sorts of problems caused by the vehicle wrapping at a different time to any of the buildings it was in contact with. Very difficult to find a solution for this so in the end I’ve settled on a bit of a hack whereby the vehicle stops moving if it’s very close to the edge of the world. This seems to work OK and I don’t think it will be too obvious in practice.